NASHVILLE, Tenn. The New York Jets' playoff hopes are gone, lost in a wave of turnovers by struggling Mark Sanchez. Chris Johnson went 94 yards for the longest touchdown run in the NFL since 2006, and the Tennessee Titans beat the Jets, 14-10, Monday night to eliminate New York from postseason contention. Jake Locker's first touchdown run of the season put Tennessee ahead to stay late in the third quarter, and the Titans intercepted four passes by Sanchez to snap a three-game skid. After bumbling around all night, the Jets somehow still had a chance to win when they took over at the Tennessee 25 with 47 seconds left following a 19-yard punt by Brett Kern. But Sanchez fumbled a low shotgun snap, Bilal Powell inadvertently kicked the ball away and the Titans recovered to seal it. It was a fitting end to an ugly game that left New York coach Rex Ryan cursing to himself as he walked off the field. Sanchez finished with five turnovers, one on each of his team's final three possessions, and has 24 this season. The Jets (6-8) needed to win their final three games and get help elsewhere to earn a playoff spot. Instead, the Titans sacked Sanchez three times and got a fourth on Tim Tebow. Jason McCourty and Michael Griffin each had two interceptions, keeping the Jets out of the playoffs for a second straight season after they reached consecutive AFC title games. Johnson, with the names of the victims of Friday's shootings in Connecticut written on his cleats, ran a franchise-record 94 yards for a TD in the second quarter. Locker's 13-yard quarterback keeper around left end put the Titans (5-9) ahead with 20 seconds left in the third. The Jets had plenty of time and opportunity in the fourth to take the lead, but Sanchez kept giving the ball away. Griffin intercepted Sanchez with 7:09 left on a pass intended for Braylon Edwards. On the next drive, the Jets got help from a personal foul when Titans linebacker Will Witherspoon hit Sanchez in the head with his helmet on third-and-4. A couple of plays later, Sanchez threw into triple coverage for Jeff Cumberland, and Griffin picked off Sanchez again with 1:51 left at the Titans 2. Even with the ugly night, the Jets' defense gave New York one final chance after forcing Tennessee to punt. Kern had a 19-yarder under pressure, giving New York the ball at the Tennessee 25. But Sanchez couldn't corral a low snap from center Nick Mangold, and Titans rookie linebacker Zach Brown recovered to finally clinch Tennessee's win. Sanchez struggled all night long, and he finished with his most interceptions in a game since 2009. The Jets even turned to Tebow for a complete series in the second quarter. They picked up two first downs and reached their own 44, but the drive stalled from there after a sack, a delay-of-game penalty and an incompletion. Sanchez returned on the Jets' next series and promptly threw his first interception to McCourty. 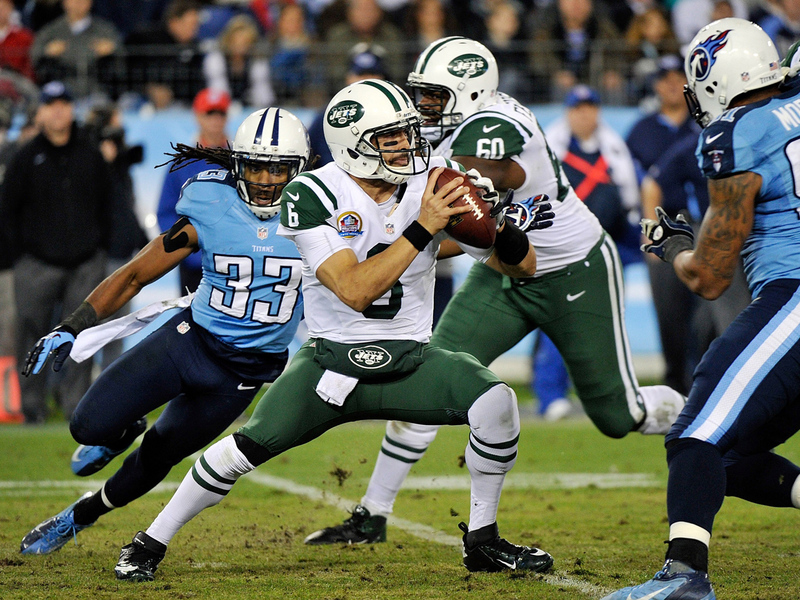 The Jets kept Tennessee from scoring a single point off all the turnovers. But the damage had already been done. Sanchez put the Jets ahead 10-7 with a 17-yard TD pass to Cumberland with 3:19 left in the third quarter. The Titans led 7-3 at halftime after Johnson's long scamper in the second quarter. His touchdown run was the longest by any NFL player since Minnesota's Chester Taylor had a 95-yard TD in a 31-13 victory over the Seattle Seahawks on Oct. 22, 2006. After Robert Malone's 53-yard punt backed the Titans up to their own 5-yard line, Johnson rushed for 1 yard on first down. On the next play, he found a seam up the middle and appeared untouched on his way to the end zone. The previous record for the longest run in franchise history was 91 yards, a mark shared by Johnson and Sid Blanks. Johnson had a 91-yard run against the Houston Texans in 2009. Blanks also did it against the Jets in 1964. It marked Johnson's sixth career touchdown run of at least 80 yards, giving him twice as many as anyone else in NFL history. Barry Sanders, Ahman Green, Hugh McElhenny and O.J. Simpson each had three touchdown runs of at least 80 yards. Johnson was otherwise held in check, finishing with 122 yards on 21 carries for his 32nd career 100-yard game. The Jets grabbed a 3-0 lead when Nick Folk's 22-yard field goal capped their first possession of the night. New York appeared to reach the end zone when Cumberland caught a 4-yard pass from Sanchez on third-and-goal, but the original ruling of a touchdown was overturned after replays showed the ball hit the ground. Before the game, a moment of silence was held for victims of the shootings Friday in Newtown, Conn. Twenty children and six adults were killed at Sandy Hook Elementary School. The gunman also killed his mother in her home before committing suicide. Johnson had the names of all the victims written on the two shoes he wore for the game. He also had the words "R.I.P. SHES" and a cross written on each shoe. The Jets had an "SHES" decal on their helmets.